Not so easy to find now days and if new, sometimes quite expensive, the waveguide transition became the target of many home-brewers. So many different dimensions and designs are published with the same idea of making a good waveguide to coax transition. If you have the possibility to measure the RL and SWR than almost any design can be tweaked for the best results, but if you can't measure it than you have to rely on the data provided by the author or constructor. The transition that I built, based on the Paul W1GHZ article was easy to copy, without any fancy tool and tuning equipment. I prefer to use his design because there are only two measures that you have to take care of while all others dimensions are defined by the standard waveguide size. 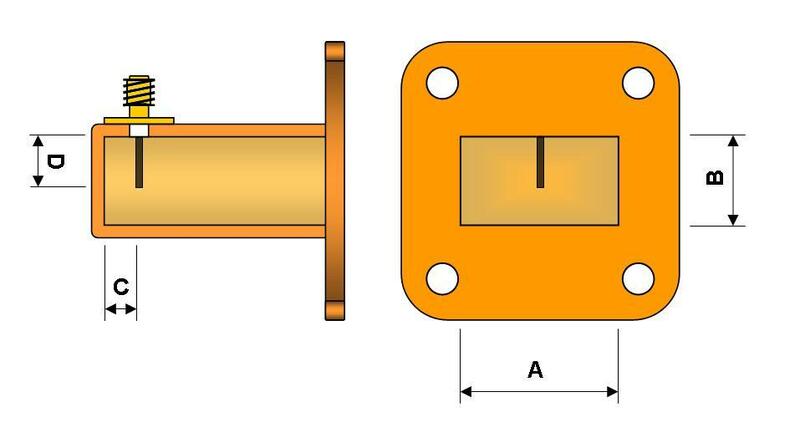 To build this transition we need a peace of WR-75 or WR-90 waveguide with the flange, SMA female connector, and a peace of the brass or copper sheet. Cut the peace of the required waveguide length, but not shorter than 1 lambda. Drill the hole for the SMA connector from the short end of the waveguide (distance C). Distance is measured from the end of the waveguide to the center of the pin hole. Hole should be 4,2 mm in diameter if you are using standard SMA connector with the teflon insulation. Find the female SMA connector with the longer pin/teflon insulation and put the same in the prepared hole on the waveguide. From the closer waveguide end cut the excess teflon inside the waveguide so only center pin will remain like on the picture below. The diameter of the center pin is 1,27 mm and the only thing you need to do is to cut the pin exactly according to the length D. This is the pin length in the waveguide!! Finally, cut the peace of the brass or copper sheet to form short end cover for the waveguide (AxB dimensions). Now when we have all parts ready, it's time to put all this together. Of course, we will need to solder the short end peace to the waveguide and then the SMA connector in the previously prepared hole. This can be done by using the high power soldering iron or gas torch with not so tidy result. I prefer to use the iron, the same one I am using for tone transfer PCB. With the highest temperature set after 5 to 6 minutes the parts will be hot enough to work with them. Using the pliers, rotate the waveguide vertically with the flange sitting on the flatiron and with the other set of pliers position the short end on the waveguide end. Use the standard soldering iron to solder the short end. While the waveguide is still hot, position the SMA connector on the place and use the same technique to solder the SMA. After the job is done, leave the waveguide to cool down for a few minutes. I make a several transitions using the same technique and the results are quite good. The RL obtained is -20dB (SWR 1:1.2) which is not bad for no-tune version. You may get lucky to get better results but if you are looking for lower SWR than you have to tune the transition. This can be done using different techniques: by changing the short end distance or even by adding some tuning screws. AD6IW give me a hint how to do this easy way. Making the hole for the SMA bigger (lonitudinally) we are able to change the distance from the pin to the short end by moving the SMA along the waveguide. Find the position where the SWR is lower and then solder the SMA. This will be good enough for all amateur applications.